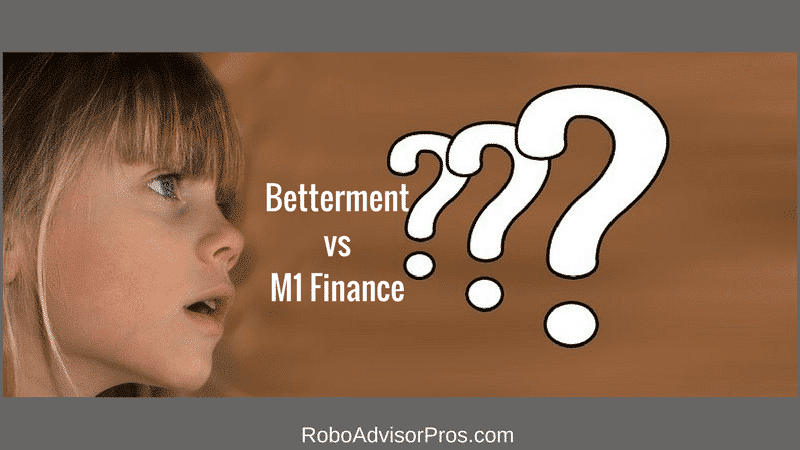 YOU ARE HERE:Home » Betterment » M1 Finance vs Betterment – Which Robo-Advisor Is the Best for Me? How Much Does M1 Finance Cost and What is the Minimum Investment Amount? 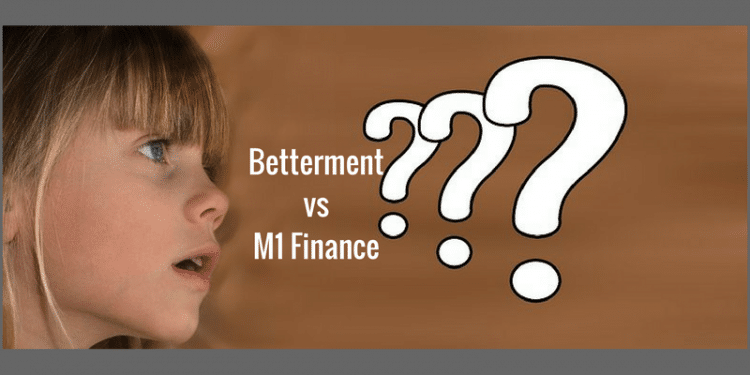 M1 Finance vs Betterment – Which is the Best Robo-Advisor for You? Overview A goals based automated investment advisor. Betterment bills itself as, "Investing Made Better." Offers a variety of human financial planning options. Free robo-advisor with opportunity to customize investments. Top Features Goal-based ETF investment portfolio. Rebalancing. Tax-loss harvesting. SRI, smart beta + income portfolios. Human financial advisor access. Unlimited variety of investment vehicles & strategies. Choose your own investments or pick from pre-made investment portfolios. Access to socially responsible funds. Rebalancing. Free Services See promotions. No management fees. Includes free rebalancing + buying and selling securities. Contact & Investing Advice Phone and email support, 7 days per week. Phone (M-F) and email, 7 days per week. Investment Funds Low-cost, commission-free ETFs. Stocks, bonds, funds, and more. Accounts Available Single + joint taxable brokerage. Roth, traditional, rollover + SEP IRA. Trust. Single + joint taxable brokerage. Roth, traditional, rollover + SEP IRA. Trust. Business accounts. Promotions Free management fee promotion in effect (time limited) Ongoing free investment management. Next, get a synopsis of M1 Finance and Betterment’s platforms. Finally, the M1 Finance vs Betterment wrap up helps you decide which robo-advisor is best for you. M1 Finance is not your typical robo-advisor which asks a few questions and then offers up a pre-made investment portfolio of ETFs in line with your risk profile. M1 Finance is akin to a combination DIY plus robo-advisor investing package. Investors create pie charts to visually design their investment portfolios. Each slice of pie is represented by an individual stock, bond or fund. Investors can create more than one investment pie or portfolio. In total, you can own up to 500 individual assets that include EFTs, stocks, or even other pies. An investment pie slice represents a percentage of your portfolio. The visual nature of this platform makes it easy to see how your investing style is reflected in the investment options you have chosen. M1 borrow, so you don’t need to dip into your investments for extra cash. For investors not sure where to start, M1 Finance also offers pre-made investment pies to choose from. The burgeoning millennial group is living life on their own terms. And that means they want to invest in what they believe in. In fact, the US Bank 2017 Wealth and Worth report found that 76 percent of millennial’s consider their investment choices as a way to state their social, political and environmental values. M1 Finance recently launched their Socially Responsible Investment Portfolios. This M1 Finance investing offering, in partnership with Nuveen, offers investments screened according to ESG (environmental, social, and governance) factors. To integrate socially responsible investing into your M1 Finance Portfolio just select from the pre-screened ESG funds and add them in. You set your own asset allocation (or choose from a pre-made portfolio), and M1 Finance does the rest. The M1 Finance rebalancing uses cash inflows and outflows to automatically rebalance back to your preferred asset percentages. Or you can push an icon to initiate rebalancing. So, you create the portfolio of assets and M1 finance manages and rebalances it. To get started, the investment minimum is an affordable $100. Your entire investment is managed for free by M1 Finance. This is a tremendous advantage for a robo-advisor or DIY investment platform with rebalancing and includes zero commission buying and selling. You can reach the support team Monday through Friday from 9:00 AM to 5:00 PM CT. If your account is valued at $10,000 or more, you’re eligible to borrow up to 35% of the value, and pay it back on your terms. The process is fast and does’t require a credit check. The low interest rate is great if you want to refinance existing high interest rate credit card debt or pay for your wedding or other expense. You can pay for an expense while letting your investments grow. Betterment is a legacy robo-advisor that keeps getting better. Like it’s robo-advisor cousins, Betterment creates a goal-based portfolio of index ETFs based upon your responses to a questionnaire. Depending on your particular goal, time horizon and risk profile your money will be funneled into a group of stock and bond ETFs selected from a base list of 13 ETFs. The available funds include U.S. and international stock funds and a variety of U.S. and international bond funds. Global view of all assets, those within and outside your Betterment account. Socially Responsible Investors – The SRI portfolios allow you to invest with your values and choose to put your money in socially responsible firms. Goldman Sachs Smart Beta Portfolios – This approach is good for investors who want to attempt to beat the market and are willing to take on a bit higher risk. BlackRock Target Income Portfolios – These bond portfolios are designed for conservative investors seeking cash flow. Betterment Premium requires a $100,000 minimum investment account and charges 0.40% of AUM. Fees are capped at the $2,000,000 AUM. That means assets above that amount are reduced to 0.30%. Human financial advice on all investments, within and outside of Betterment accounts. That includes managing 401(k)s, real estate, stocks and more. Unlimited access to CFP® credentialed financial advisors for all life planning decisions that impact your money; retirement, having a child, getting married and more. Betterment recently launched five specialized advice packages. The programs are designed for specific investors. The Getting Started package is great for newbies who want a quick assessment of their account. The Financial Checkup package is designed for a thorough investment portfolio review. The College Planning package is for parents who want help navigating the college planning (and payment) process. And the two remaining packages, marriage planning and retirement planning are as their names suggest. The one-time fees for these add-ons range from $149 to$399. The decision is simple. M1 Finance and Betterment are each designed for a distinct type of investor. And, we like both M1 Finance and Betterment robo-advisors – a lot. If you’re looking for a full service, hands off robo-advisor with tax-loss harvesting features and access to human financial advisors, then choose Betterment. You complete a questionnaire, transfer your funds into the platform, and Betterment does the rest. Betterment’s a la carte financial planning services and the ability for all users to text with a financial planner gives you ready investing guidance. If you want a hand in your own investing and prefer to choose from a wide array of funds, stocks and bonds, then M1 Finance is your best alternative. With roughly 6,000 investments to choose from and pre-made porfolios, M1 Finance is ideal for the intermediate to sophisticated investor. With M1 Finance, you can control your portfolio creation (or not). After that, M1 Finance does the investment management and rebalancing. If you’re looking for free investment management, and can forego texting access to financial advisors and tax-loss harvesting, then M1 Finance is a bargain. In the end, it’s about how much hands on control you’re seeking with your investing, what services you’re seeking and whether you’re willing to pay a fee for investment management. DIYers tend to prefer M1 Finance while DIFY (do it for you) investors will be in experienced hands with Betterment. Which option seems the best for you? Write in and let us know the digital financial advisor that you prefer. I have accounts at both investment firms. This way, we can get advice if we wish (with Betterment). They’ve been around a bit longer and have more tools/resources. Their customer service isn’t as good as M1 (in my experiences). M1 is great because I can choose either one of their pre-made pies, or I can choose a mixture of ETFs and individual stocks. Their customer service is much better as they do training webinars and seem much more helpful over the phone and email. A big bonus (to me), for M1 is that they will handle moving any account from somewhere else to them (except they aren’t allowed to do 401(k) transfers. Betterment doesn’t do this. Instead, they supply a form for the customer to fill out. Hi Lynn, Thanks so much for your detailed feedback. I don’t think you can go wrong with either – or both platforms. 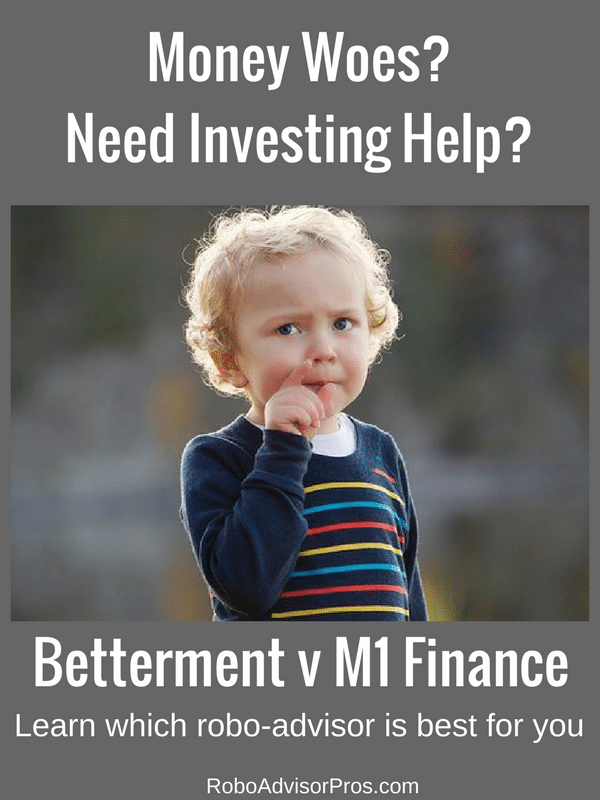 It’s a nice mix, using both Betterment and M1 Finance, as the DIYer can create their own portfolio in M1, they’ll rebalance it for you, for free! While Betterment’s fund choices and features are based upon sound investment theory and they offer sound investment choices. what investments did you choose in your M1 Finance portfolio? We have a couple ‘pies’ there. We’ve used some of their premade pies and have chosen more long-term investments. In my husband’s IRA, we chose a number of individual dividend paying stocks. I found once you make a pie, you can’t add individual stocks to it, nor can you add a new pre-made slice. What you can do is decrease percentages from within the pie. So it’s important to choose carefully – or you can simply sell it and move it all to a new investment. Lynn, I don’t know if it’s an upgrade, but you can add (or remove) slices from pies now. Go to My Pies at the top, then go to pie under My Portfolio. Click on the pie you want to change. Above where the slices are listed you can click on Add Slices or you can check the box next to an existing slice and a remove icon will appear next to the Add Slices button. Make sure you click Save Changes at the bottom of the screen. Since the pie is already in use, it will come up with a warning that this will change your portfolio and ask you to confirm or cancel.